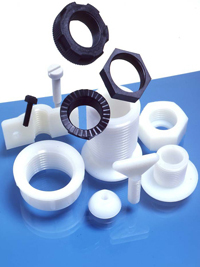 Bluemay has been manufacturing plastic injection mouldings since the Company was founded in 1973, and has developed expertise and systems which allow us to achieve the highest standards of production control. Computerised moulding machines are just part of the programme of investment over the years which, with the team of skilled production staff, enable us to offer a complete service for custom injection mouldings. Our customers range from small owner-manager businesses to multi-national household names such as Siemens, and we are well equipped to deal with JIT and KANBAN requirements. We supply almost every type of manufacturing and assembly industry, although no one customer or industry approaches 10% of our turnover. Use the Navigation bar to explore the different aspects of custom injection moulding on offer.